Beer, Sports Talk And Sometimes Music! In this beer blog, we are going to get into another beer from Mountain Town Brewing. 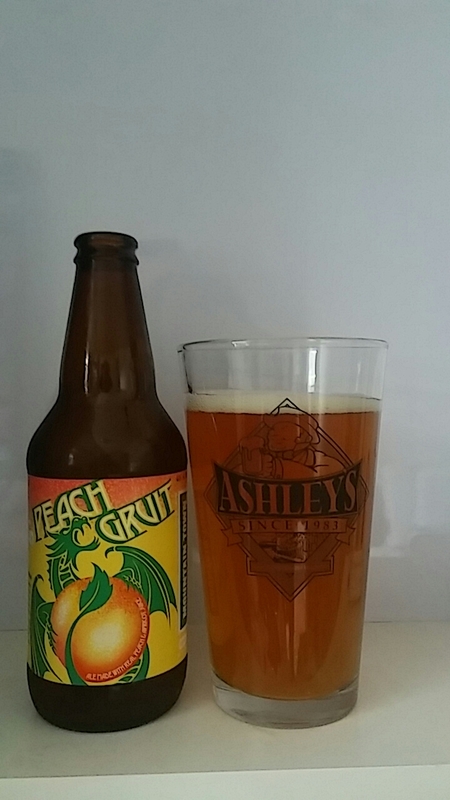 It is their Peach Gruit Ale. If you read my earlier beer blog posts on their beers, you know the history of this Michigan craft brewery. If you have not, please, read them to get to know this Midwest craft brewery. Let us get into this fruit beer. It has a heavy cloudy yellow color with a white head that disappears over time. The aroma has a metallic peach notes. The taste has a sweet peach to apricot notes with a wet peach aftertaste. It is drinkable beer. In this special beer blog, we are going to get into another beer from New Belgium Fat Tire And Friends. It is a joined beer with Rhinegeist Brewery. The beer is called Fat Pale Ale. If you read my earlier beer blog posts, you know the rich history of New Belgium Brewery. If you have not, please, read them to get to know New Belgium Brewery. There is not much information about Rhinegeist Brewery. I do know that they are from Cincinnati, Ohio. Let us get into this Pale Ale. It has a clear copper to light amber color with a semi on white constant head. The smell has a malty to biscuit notes. The taste has a malty, biscuit, slight citrus notes with a malty aftertaste. It is extremely drinkable beer. Fat Tire to the XP and A. The innovative folks at Rhinegeist went all new-style on Fat Tire. The result is a Belgian-style XPA. A combination of fruity Belgian yeast, bready-sweet European and Colorado malts and a healthy dose of fruity, vinous hops. Perfect for hopheads, wine lovers, beer fanatics and even whiskey quaffers. In this beer blog, we are going to sample another beer from Thirsty Dog Brewing. It is their Raspberry Ale. If you read my earlier beer blog post on their beers, you know the history of this Ohio base craft brewery. If you have not, please, read them to get to know this Midwest craft brewery. Let us get into this beer. It has a clear golden color with a white constant head. The smell has a heavy raspberry notes. The taste has a sweet raspberry notes with slight tart raspberry aftertaste. It is extremely drinkable beer. In this beer blog, we are going to talk about the return to Stroh’s Beer to the City of Detroit. I will get into a little history. Stroh’s brewery, which was known as Lion’s Head Brewry, started in 1850. The first beer that was introduced was a Bohemian-Style Pilsner. It is crazy think they are repeating history with this once third largest United States Brewery. When Bernhard passed away, the son took over and renamed the brewery B Stroh’s Brewing Company. In 1902, the company removed the B and called themselves what they are known as now, which is Stroh’s Brewing Company. When Prohibition hit, they like other breweries they had to changed their business model. They made near beer but they made Stroh’s Ice Cream. It is still being made to this day. It is not being made in Detroit but their distribution center is still in the city. In 1982, Stroh’s brought a huge part of Schlitz’s Company. This put this brewery number three in the United States. This is where everyone points to the end of Stroh’s. Stroh’s in 1985 closed their 135 year old brewery. It was knocked down in 1986. Stroh’s sold to Pabst in 1999. Stroh’s Lager with the blue can was new designed in 1987. Let us talk about the Pilsner. The Pilsner has a clear golden color with white constant head that will lace on your glass. The aroma has a nice floral notes. The taste has a nice balance to make it extremely drinkable beer. There is some nice sweetest from the malt but a nice hop bitter snap. This Pilsner is a little bit more bitter than your American Lager. I am too young to remember Stroh’s nor try it back in the day. I have been told that it has the Stroh’s snap finish. It is extremely drinkable beer. In this beer blog, we are going to get into another beer, which is called heavy Lifting IPA, from Boulevard Brewing. If you read my earlier beer blog posts on their beers, you know history of this craft brewery. If you have not, please, read them to get to know Kansas base craft brewery. Let us get into this IPA. It has a clear golden color with a white constant head. The aroma has a citrus notes. The taste has a citrus to piney notes with a dry piney hop bitter aftertaste. It is kind of drinkable. Heavy Lifting is our newest year-round beer based on our popular Tasting Room beer Mid-Coast IPA. Mid-Coast became a favorite among hopheads for its big, bold hop presence. Heavy Lifting takes that legacy further in fine style, exploding with flavor and a huge helping of five remarkably zesty and piney hops (Centennial, Citra, Amarillo, Topaz and Cascade). In this beer blog, we are going to get into another beer from Boulevard Brewing. It is their Calling IPA. If you read my earlier beer blog posts on their beers, you know the history of this Kansas base craft brewery. If you have not, please, read them to get to know this craft brewery. Let us get into this IPA. It has a cloudy golden color with a white constant color head. The aroma has a nice heavy citrus notes. The taste has a citrus to tropical fruit notes with a hint of grapefruit notes. The aftertaste has a citrus to hop bitter notes. It is pretty drinkable beer. In this special Beer Camp blog, we are going to sample the third of six beers in Sierra Nevada Brewery’s Beer Camp beer series. it is their Family Values Imperial Brown Ale. If you read my earlier beer blog posts on their beers, you know the history of this California base craft brewery. If you have not, please, read them to get to know Sierra Nevada Brewery. Let us get into this brown ale. It has a dark brown color with tan constant head. The aroma has a nutty notes. The taste has a sweet malty to nutty notes with an alcohol hint. The aftertaste has a malty dry finish. It is a sipping beer. Family Values showcases the cooperation and kinship of Midwestern brewers. It features largely Midwestern-grown ingredients: Minnesota wild rice, Indiana honey, Missouri oats, Michigan hops, and cocoa nibs from Illinois as well as Sierra Nevada’s estate-grown malt. This is our centrally located collaboration celebrating the best of the Midwest. In this beer blog, we are going to sample another beer from Jolly Pumpkin Brewery. If you read my earlier beer blog posts on their beers, you know the history of this Michigan base craft brewery. If you have not, please, read them to get to know this Midwest craft brewery. Let us get into this golden ale. It has a cloudy golden color with a white constant head. The aroma has a floral to pepper like notes. The taste has a lemon to pepper like notes with a slight sour in taste profile and aftertaste. It is a nice sipping beer. Brewed in the Franco-Belgian tradition of strong golden ales. Spicy and peppery with a gentle hop bouquet and beguiling influence of wild yeast. In this beer blog, we are going to get into another beer from Jolly Pumpkin Brewery. It is their Bam Noire Dark Farmhouse Ale. If you read my earlier beer blog posts on their beers, you know the history of this Michigan base craft brewery. If you have not, please, read them to get to know this Midwest craft brewery. Let us get into this dark saison ale. It has a clear dark reddish color with a white constant head. The aroma has a dark fruit to farm like notes. The taste has a lemon like notes that is a little tart. It has a tart to sour like aftertaste. It is kind of drinkable beer. Dark, smooth and delicious. Aromas of worn leather and cool autumn nights. Notes of sweet plum and toasted raisin, hints of coffee and cacao. Lingering tart and refreshing finish. In this beer blog, we are going to sample another beer from Founders Brewing. It is their Sumatra Mountain Brown Ale. If you read my earlier beer blog posts on their beers, you know the history of this Michigan base craft brewery. If you have not, please, read them to get to know this Midwest craft brewery. Let us get into this brown ale. It has a cloudy dark brown color with a tan constant head. The smell has a heavy coffee notes. The taste profile of this brown ale has a smooth nutty to coffee notes with a smooth slight milky coffee notes aftertaste. It is drinkable and scary because it is a 9% ABV beer.